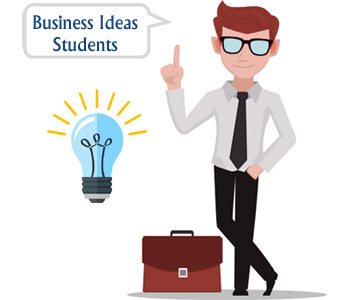 Business Ideas for Students – Everyone knows that college students struggle a lot to get a good job. Unemployment and joblessness are very common today. To overcome this type of situation it is always recommended to start a business at student age either in school or college. Starting a business at student age have many advantages. It will help you to limit your debt liability (Student Loan) as well as help you to handle other financial obligations. You can get exposure to the business at an earlier age which will help you to start something big at a later stage of your life. If you are a student and searching for the best small business ideas with low investment, you are at right place. In this post, I will share 20 Small Business Ideas for Students that can be started with zero or low investment. You need to select an idea in a manner so that It will not affect your study time. First online business idea for the student is blogging. Blogging is a very good business option. In blogging, you need to start a blog in a specific niche of your knowledge. Few popular niches are finance, traveling, technology, etc. Once your blog gets popular and generates traffic you can earn money from direct advertisement. I know many student bloggers who are earning very good monthly income by blogging. Becoming a virtual assistant is next in the list of business ideas for students. It is a completely online business where you need to login to various websites such as Amazon Mturk, Fiverr to get a job as a virtual assistant. You need to complete various tasks such as typing letters, replying emails, scheduling meeting, etc. You will be paid fixed money for the tasks based on hours. Next business idea for the student is becoming a YouTube Personality. If you are young, dynamic and talented you can become YouTube Celebrity. In this business, you need to start your YouTube Channel on a specific subject such as movies, gossip, news, comedy, etc. You need to post creative videos on this channel. You will need high-quality camcorder for this. Once your YouTube channel becomes popular you can apply for the YouTube Channel Partner program. This program will help you in earning money by showing advertisement on uploaded videos. The task of e-book author is to write a book and sell it online on Amazon or eBay. If you have writing skills and command over English this idea is for you. In this business, you need to write e-books on various topics as per your area of interest. You can also make a course book. You need to work hard on promoting your e-books. You can earn a lot of money from this business. Paid survey is a task where you need to provide your opinion on various products and services online. There are many companies looking for genuine feedback about their product and services. They are ready to spend money on this. To start this business, you need to login to various survey website such as SwagBucks, SurveySavvy etc. You can earn a decent income with this idea. PTC (Pay to Click) is a new profession where you can earn money by viewing or clicking an advertisement. There are many legitimate PTC websites offering these services. You need to register on the website and start working. You can spend one or two hours daily on PTC jobs and earn reasonable money. Affiliate Marketing is next in the list of best business ideas for students. Affiliate marketing means selling or promoting product or services of your associate companies and helping them to increase the sale. You will be paid commission for every sell. Most of the companies offer this type of program. Once you register as an affiliate you will get link and promotion material. You can share this material on Facebook, WhatsApp or via e-mail marketing and earn money. Freelancing is a business which demands specific skills. Some examples are website designing, graphic designing, software development, mobile app development, SEO etc. If you have knowledge and expertise in student age you can start this business. This business demand timely delivery of the project. Few website offering freelancer jobs are UpWork, Murk etc. One of the simplest forms of business for the student is buying and selling things online. You can either sell surplus products which you have or you can buy things from others at a low price and sell it online at a higher price. Make sure to select things carefully. This is to avoid physical inventory. Digital marketing is a new career option. Most of the company are looking for an online expert who can help them in marketing their products. Digital marketing includes multiple things such as search engine marketing, social media marketing, content marketing, email marketing etc. It is recommended to go through the digital marketing course before starting this business. The first offline business idea for a student is Home Tuition. If you are a college student with good academic and interested to teach children, you can start home tuition business. In this business, you need to give tuition to small students at their home. You can give this tuition in part-time and earn money. The second business idea is computer repair business. This idea requires knowledge of computer hardware. It is advisable to go through IT course such as Jetking or ITI before starting this business. You may plan to start an online website for getting good business. Initially, you can do service call later stage you can plan to sell IT hardware also. DJ Services is a very popular business idea for students. If you are a music lover with full of creativity you can think of starting DJ services business. You need to invest money on CD Player, Turnable, Mixtures, and speaker to start this business. Next Business idea for the student is computer Training. Basic Computer Knowledge is becoming mandatory in every field. If you are a college student with IT skills and knowledge about computer, you can start a computer training business. You can start this business from home also. You need a few old computers to start with. Insurance Agency is one of the best part-time business ideas for the student. In this business, you need to sell insurance policies. You will earn commission on every policy. You should have good communication skill and convincing power to become successful in this business. MLM or Network Marketing business is next in the list of best business ideas for students. You need to work hard to get success in this business. In this business, you need to sell the product and services of an associated company. You will get commission income from your sale as well as from your team. A Local tour guide is location specific business. If you are living or studying at the travel location this business is for you. In this business, you need to act as travel guide. You should be aware of geographical location and history about space to become local tour guide. Account & Record keeping is another very good business idea. If you have knowledge and expertise about finance software you can start account and recordkeeping business. In this business, you need to keep records of all financial business transactions. You can get fixed money for this. You may require special training before starting this business. Cleaning service at home is another very good business option. This business requires management of unskilled manpower. If you have expertise in manpower and contract management, you can start this business. You will need cleaning kit and vacuum cleaner for starting this business. Another business idea related to house is home repairing services. Every house demand repairing, thus starting house repairing could be very good business option. You need to mange team expert in various area such as civil, plumbing, electrical etc. As you can see there are many business opportunities for college students. You should select a business opportunity based on your expertise and skill set. In addition to skillset, you should also look at the daily time required by this business. Make sure that your business should become a hurdle in your study. « EPF UAN Correction – How to update Name, Birth Date Online in UAN?